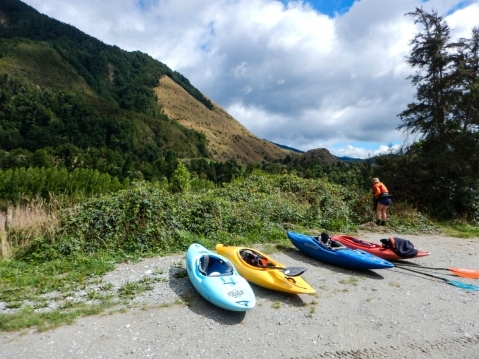 I spent only three (glorious) weeks on the South Island of New Zealand. That’s hardly a blip in time, and really I’m no more familiar with the truths of the Kiwi Way than a traveler who’s only been to New York City is familiar with America. I only got a taste. But the taste was so sweet that I wanted to share just a little of what I experienced while on the flip side of the equator. So, if you’re a regular Kiwi and I’ve totally botched something here, by all means let me know. Otherwise, THANK YOU for making New Zealand truthfully the most hospitable place I’ve ever been privileged to visit. I’d like to think that these folks saw something in us, some recognition of shared values, and trusted that we wouldn’t trash the haunts they love. Here in the US, we have our guard up. Often times we don’t want to share our secret spots, for fear they’ll be overrun. It was a lesson in trust and faith in humanity, and holy smokes was that refreshing. Blackberry pickin’ at the Middle Matakitaki put-in. How did this affect my boating experience, you ask? Well, it shaped it entirely. That part of the story starts at Riverside Holiday Park in Murchsion—which, by the way, I could not recommend highly enough. Within, oh, maybe twenty minutes of rolling into camp, we found ourselves with two new boating friends. 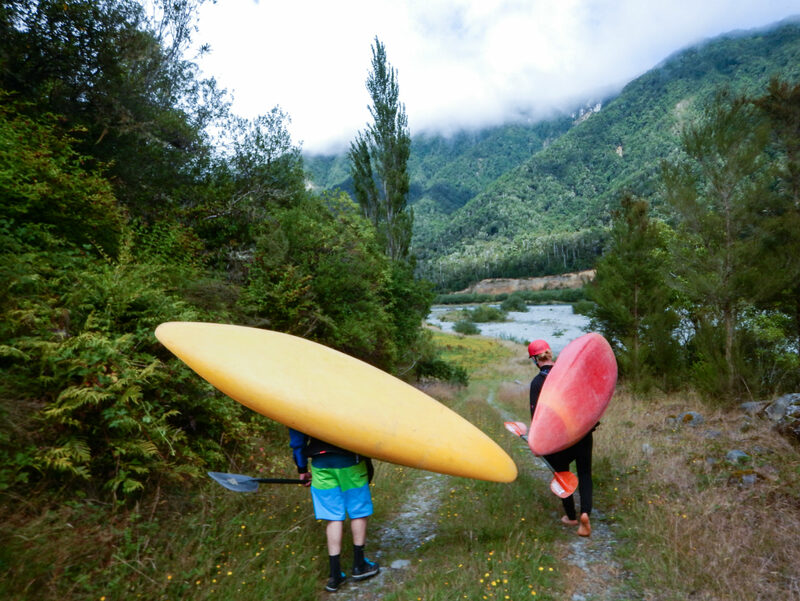 Tesh and Sam were from Nelson, paddling away their weekend same as us. They took us on our first stupid-blue ride of the trip. I never did get used to the color. 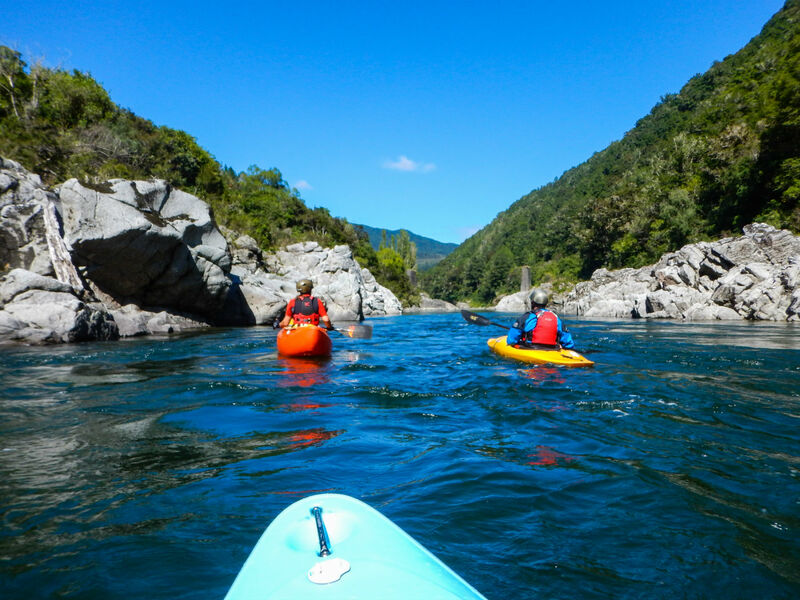 It was a scenic paddle and we talked about flows, grades, and other runs while Kurt and I dialed in our rental gear and gaped at the water. 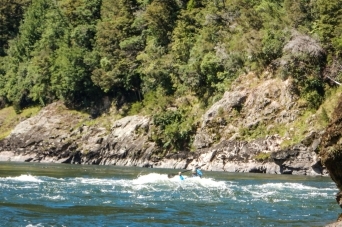 Later, we bumped the adrenaline up when we followed another local down a techy lower Mātakitaki. (I wish I had more photos of this stretch for you, but I was too busy gracefully white-knuckling my paddle strokes.) Our new friend Matt preferred an open canoe to the confines of a kayak, and it was humbling to watch him surf, boof and finesse his way down the chunky stretch. 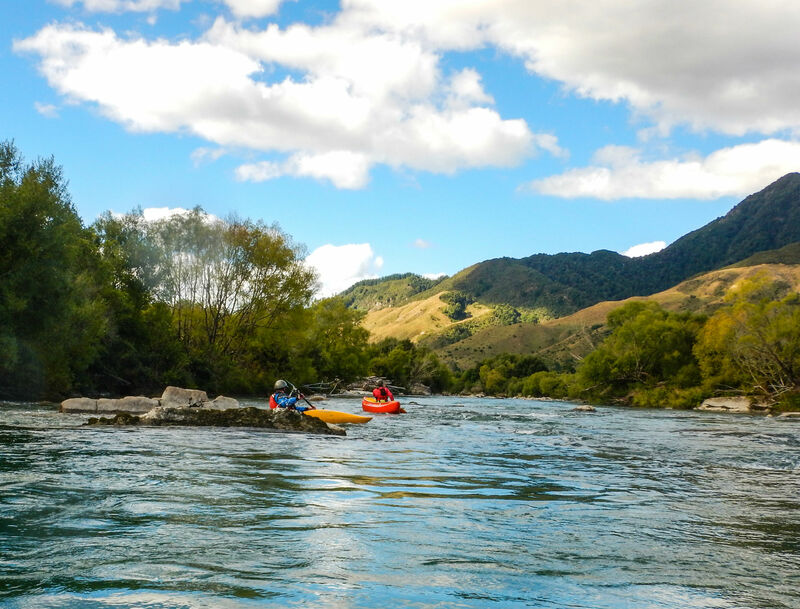 We continued paddling with Matt the next day, soaking up classic Buller whitewater and comparing notes on gear, rivers and multi-day experiences. 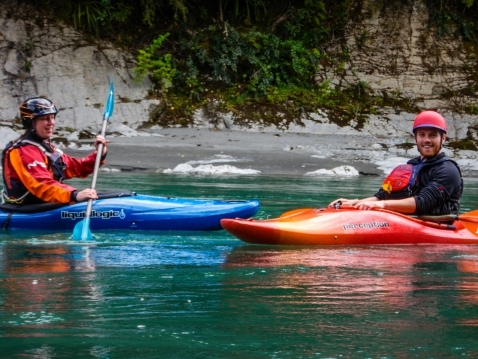 We also picked the brains of the fine folks at the New Zealand Kayak School (where we had rented our boats) and I noticed a couple of themes that our conversations kept circling back to. First, regardless of your skill level, there seemed to be no shame in enjoying the gosh-darn-heck out of yourself on a class II run. 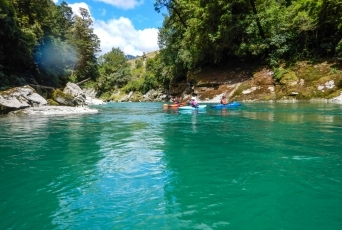 Don’t get me wrong, as paddlers I think we all agree with this at an individual level, but back home (where I’m writing from now) there can be an attitudinal division between folks whose current threshold is class II and folks that are paddling class III. Then, there’s another division between the next two classes, and another after that. As we break through these divisions, leveling-up one class at a time, I think we sometimes forget to look back and remember why we’re on the water in the first place. Based on what I saw during my quick trip, that’s not the Kiwi Way. Then, there’s gear. Kurt and I didn’t want to pack all of our paddling gear, not to mention the pain that is checking a boat on an international flight. 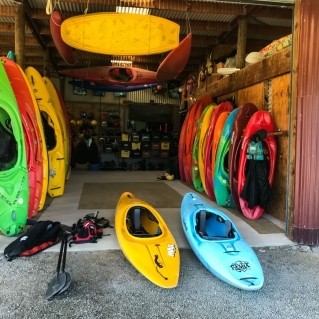 As we checked out gear from a local kayaking school, I was reminded (as, I imagine, are most Americans when they first paddle overseas) how easy we have it when it comes to acquiring exactly the equipment we want. 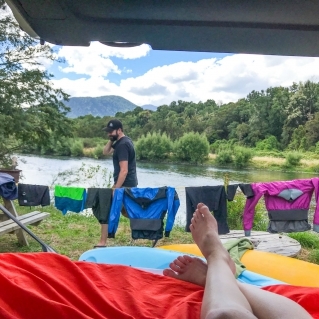 Assuming we’ve got the funds and can navigate difficult decisions like “which color?” and “do we want expedited shipping?” we can turn over closets of boating gear as often as we want. Not the case overseas, especially somewhere as remote as New Zealand. But, just like here, when you get a hold of that perfect drytop or sprayskirt, you make it last—that old NRS gear, superbly maintained and hanging up at the shop gave me lots of warm fuzzies. That’s the Kiwi Way. Like all good things do, our time in Murchison came to end. I turned in my rental boat, finding the mini-relationship I’d built with it over the last few days hard to snuff out. 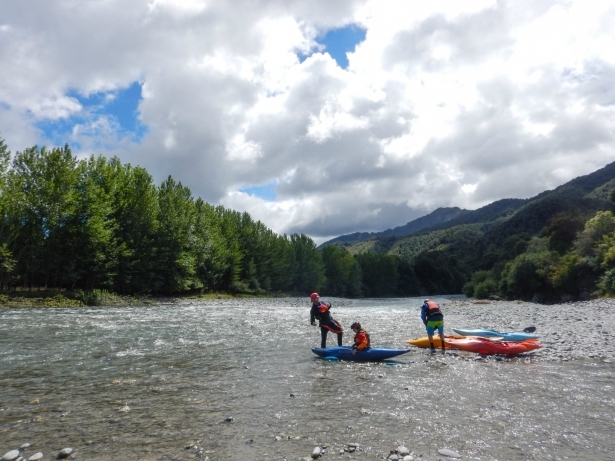 There was such a part of me that wanted to stay there, where rivers like the Buller, Mātakitaki, Matiri and Mangles come together, but the South Island is a big chunk of land and our trip had only just begun. We loaded up on tips and tricks from our new friends, and continued to wander. We didn’t get it all exactly right, but when we’d find ourselves in an immeasurable crowd or locked between a long line of campers on the highway, I’d think again of what we’d been told. Take that unmarked road. Try this local pub. How long is your trip? Tell me about Idaho. Potatoes, right? Let me see that map, I want to show you something. Here, welcome to our country and let me share something that I love about it with you. 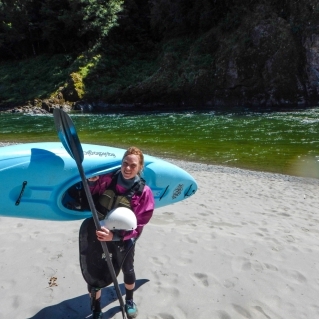 Editor’s Note: Guest contributor Kate Job is a purchaser for NRS and her favorite part of the gig is getting to use the very gear she helps buy. A weekend warrior by trade, she doesn’t leave town without the essentials: gear, beer and a mess of blue cam straps.